The Spanish Military Hospital building is a reconstruction of the Military Hospital that stood on this site during the Second Spanish Colonial Period, 1784-1821. 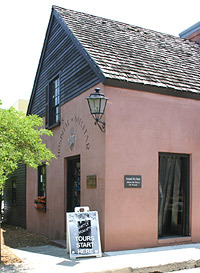 This site has a very rich history, as does most of St. Augustine. This land is reported to originally have been part of a church burial ground, with numerous unmarked graves here. The Military Hospital was built on this burial ground around 1791. Of course, being that this was a military hospital there were also, an untold number of deaths here. It is said that, there have been multiple sightings of two women in white, who are thought to have been nurses who helped in the hospital. 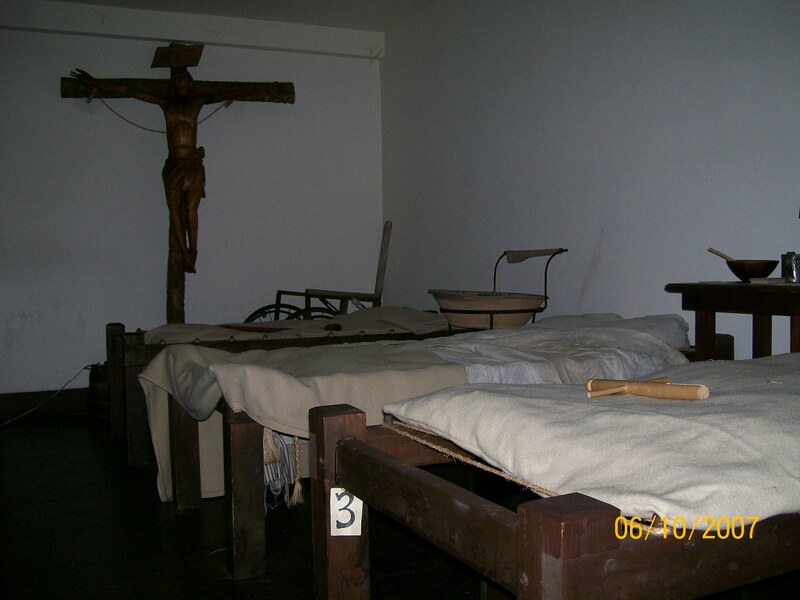 They are occasioanlly seen around the beds in the ward room. There are also numerous reports of hearing footsteps, door opening on there own, disembodied voices, and areas of cold spots. We started our investigation at 12:00 midnight, and the investigators present were; Sherri, Shereen, Jenny, Lynn, Mac, Erin and Chris (Hospital Staff). 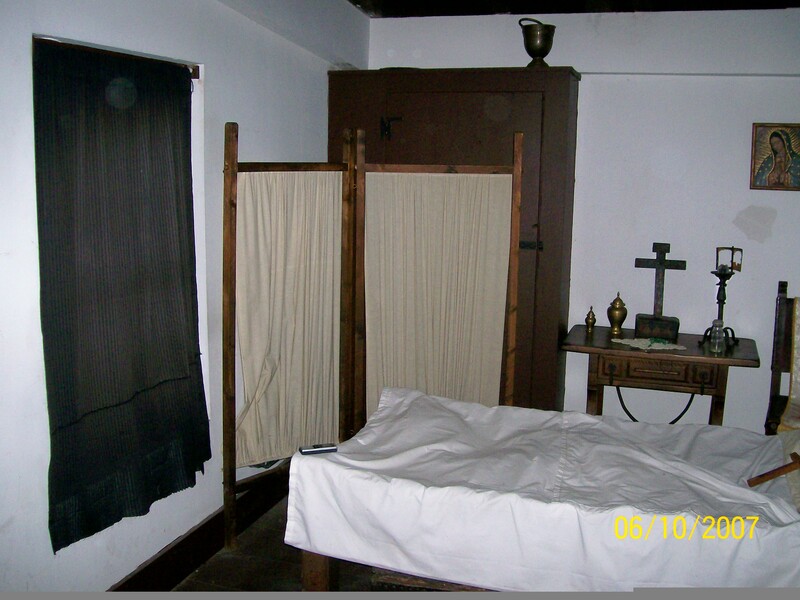 We first set up our video cameras in three locations; the Ward, the Apothecary and at the foot of the stairs, we also placed Audio recorders in the Mourning room and the Surgeon's office. Baseline Emf readings were taken with an average of 0.2, and an average temperature of 78. We had the air conditioner turned off and went lights out at about 12:20. During the course of the investigation each of our investigators experienced different things, some we could explain. 2. 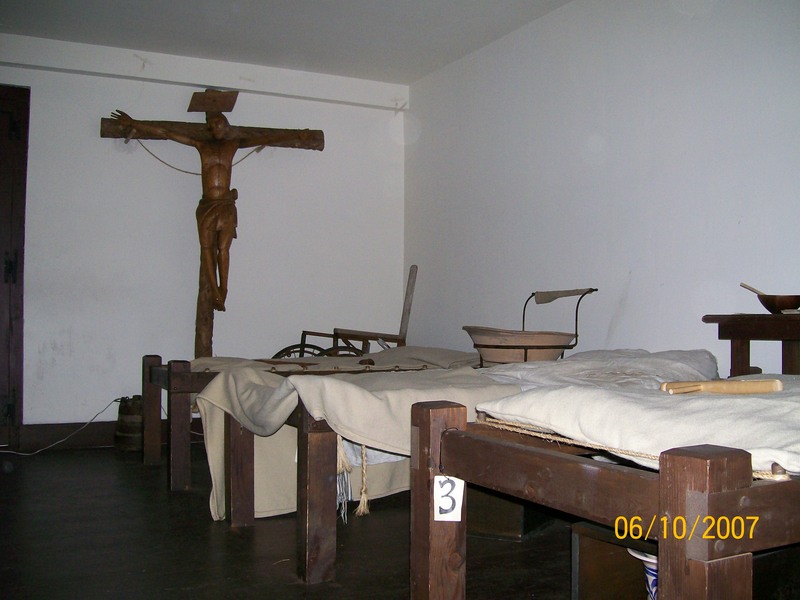 Sitting on the bench next to the cross in the Ward room, Jenny felt something lightly touch her ankle and about an hour later Shereen felt the same thing while sitting on this bench. A search of the area did not produce anything that could have brushed against their ankles. 3. 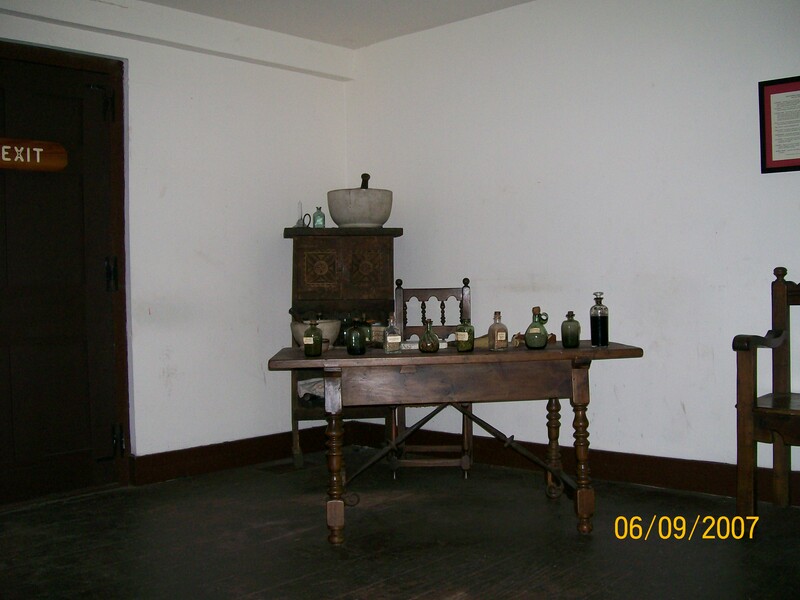 Erin and Sherri were sitting in the Apothecary room and the door to the ward slowly swung open. This happened several times during the night, in this room and also the ward. These are fairly heavy wooden doors, that should not have done this on there own. 4. 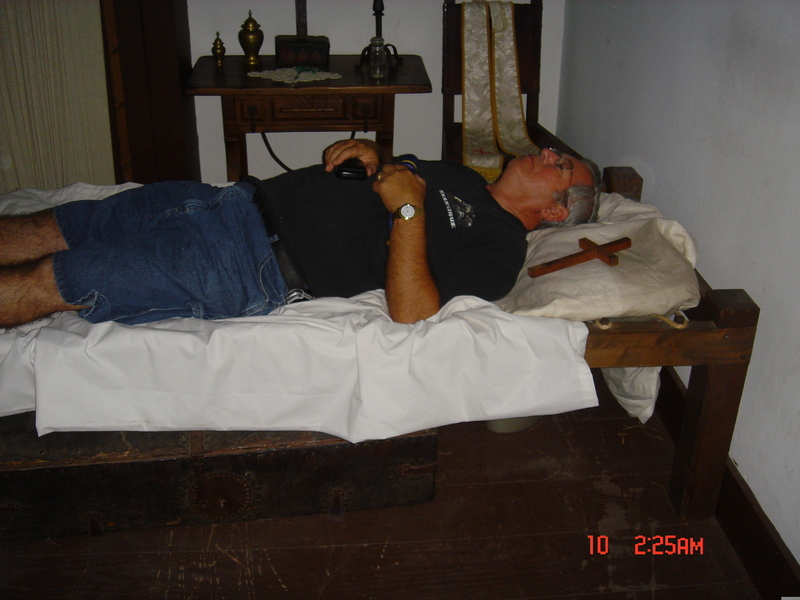 Several times we got high EMF readings(4.6) in the mourning room. 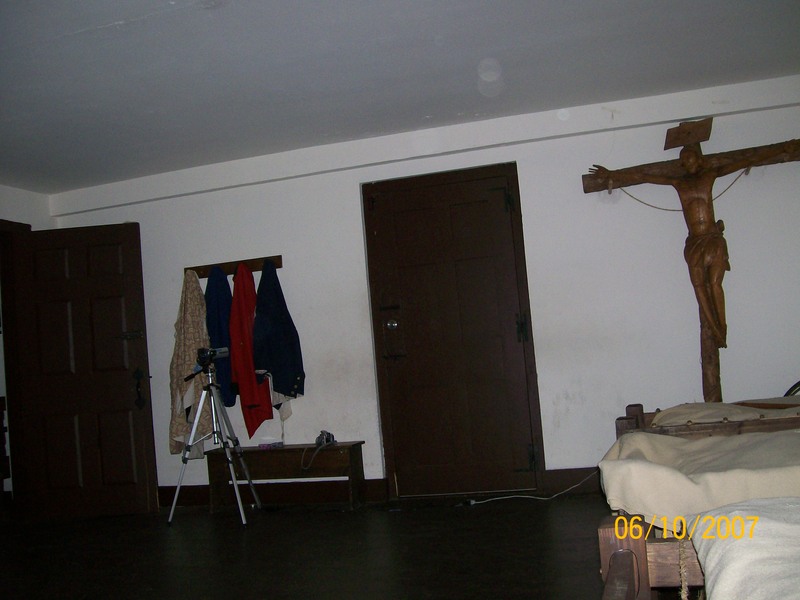 These seemed to be centered around a chair that was placed beside the bed, Investigating this we found that even though the AC had been turned off, there was a seperate upstairs unit and every time it would kick on we would get these readings. This chair was no were near the AC unit, and we could not find any electrical wiring from it, but it was absolutely consistant about causing these EMF's. 6. We had several reports from our investigators of hearing voices. We found that there was a late night establishment behind this building that we could hear voices and laughter coming from. There was a lot of pedestrian traffic also, that could have accounted for some of the voices. 7. Walking by the surgeon's office about 4:00, Shereen heard the sound of a shoe scuffing on the floor in this empty room. 9. Several reports of shadows and movements-again due to the high volume of traffic outside, this could account for the shadows. 10. Jenny, Lynn, Mac and Chris (Hospital Staff) were upstairs around 4:00am, and heard what they thought was glass breaking on the stairs, investigation showed nothing to account for this. 11. Walking into the front room from outside, Jenny and Shereen both heard a deep sigh, everyone else were still outside the building. A full evaluation of all our data has been completed with the following outcomes. 1. 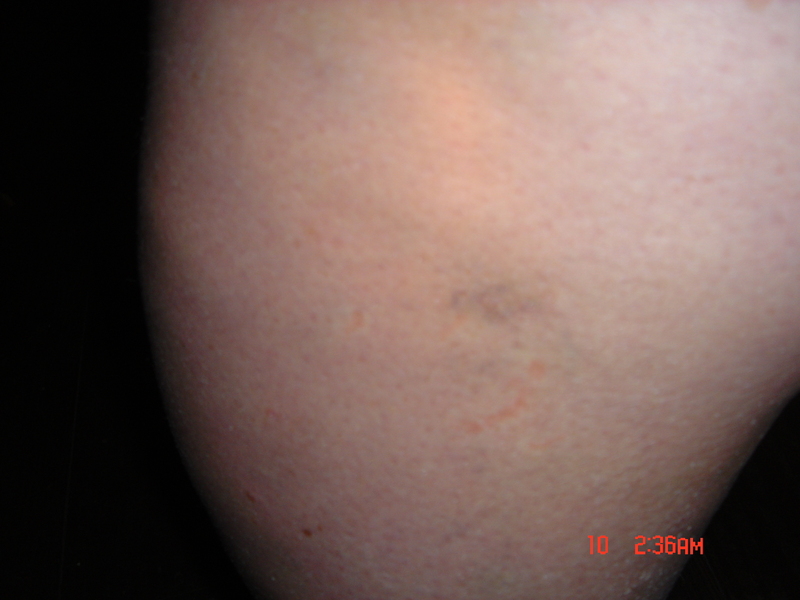 No confirming data was obtained on either the bite mark on Sherri's leg or Jen and Shereen relating the feeling of being touched. With out any confirming data, these incidents will be described as personnel experiences. 2. The noise of breaking glass that the team upstairs heard towards the end of the investigation was confirmed on two of the video cameras. This noise on audio did not sound like glass breaking but was very distinctly the sound of squeaky wheels rolling across the floor. As I said this noise was picked up on recorders in two different rooms. 3. The audio/video camera set at the bottom of the stairs also picked up a flash of light from the deserted upstairs followed by a sound that can only be discribed as a cross between a vacuum cleaner and a growl. A very unusual noise. 4. We also captured a multitude of moving orbs on video. This proved to be a very interesting investigation.